If you are from Canada and wish to build a log home, you have come to the right place! 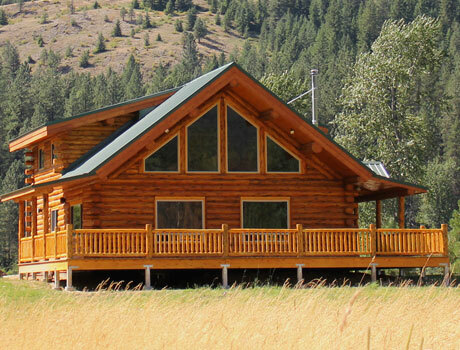 Meadowlark specialises in designing the log home of your dreams for your property in Canada. Canadians from British Columbia to Ontario are happily staying warm in winter and cool in summer in their Meadowlark log homes with our energy efficient system. Our log construction style is so tight and well built that they are a perfect choice for very cold climates. It is hard to imagine a more energy effient structure. A typical monthly winter heating cost ranges from 20% to 30% less than an average frame home! In selecting your home design, the process is the same in Canada as it is for our USA Customers; all construction in Canada is built using standard measuremants in feet and inches. All of our floor plans can be customized, and will meet Canadian building codes; our construction style is well accepted and respected in Canada. The process to ship our log and timber frame homes into Canada consists of paperwork and preparation for the border crossing. We use a Certified Customs Broker who invoices the Customer for the correct GST sales tax, prepaid prior to the log package delivery to Canada. The Broker will prepare the paperwork so that the truck is pre-cleared for hassle free processing at the port of entry at the border. 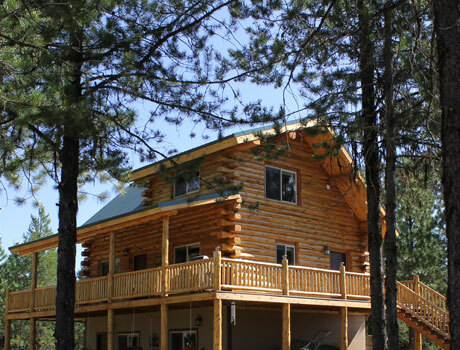 In addition, our staff at Meadowlark has experience in bringing log homes into Canada from the United States and can help answer additional questions you may have. We have Meadowlark-trained Canadian Builders available to erect your home so that you can have a great home building experience. Contact one of our staff who can assist you and connect you with the Canadian Builder.